I hope you all had a lovely weekend! This week’s going to be a busy one for me, as it’s the last one in the office before heading over the pond to run an event in DC, so there’s no time for easing myself back in gently, sadly. Straight into today’s post then, and it’s all about a look that never goes out of fashion, but is having a big moment this season: lace. Erdem, Ralph Lauren, Elie Saab and D&G in particular used this fabric in abundance in their S/S11 shows, and D&G’s white lace dress has been hailed as the dress of the season. And of course there was the Duchess of Cambridge’s McQueen triumph (any excuse to include a royal wedding pic). Lace is a perfect look for summer, and although seen as very romantic and whimsical, it can be toughened up to great effect with a leather or khaki jacket (think Kate Bosworth). It doesn’t have to be just the traditional ivory lace, either… coloured lace is equally hot at the moment, and you can go for the heavier material or the more sheer, floaty version depending on your preference. 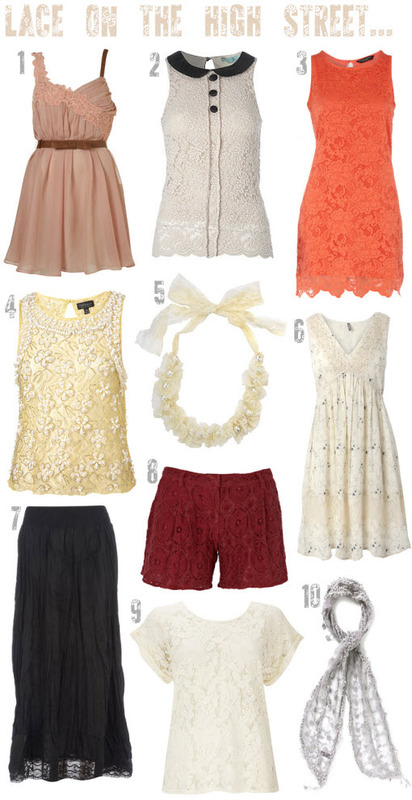 Are you on board with the lace trend, or do you worry about net curtain comparisons? I’d be interested to hear your thoughts! I have always loved lace and these photos are absolutely gorgeous. I love lace so much!! Great post.